This week our challenge at There She Goes is brought to us by Karin! She has challenged us to make a card or project creating a scene using animals! TSG has so many sets that include animals, this should be an easy one. 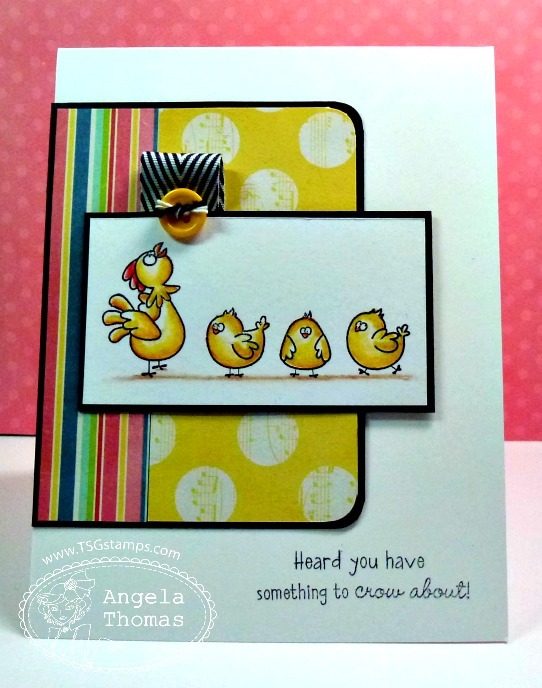 I had so much fun making this card using the TSG set called Poultry in Motion. I have stamped the images with Archival black ink and then colored with Prismacolor pencils and Gamsol. The layout for my card is the current Retro sketch. 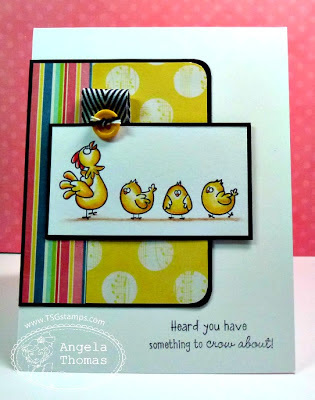 To be eligible for the giveaway, create a NEW card or project using this week’s challenge, and then come back to the TSG Blog to add your name and a link to your project in the InLinkz that is located at the bottom of this challenge post. This challenge is open until the winner has been announced on the following Monday (July 15th). The winner will get a $5 gift certificate to use in the TSG Web store! 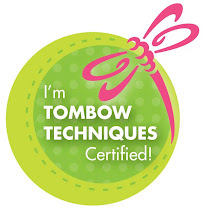 You do not need to have a blog to be able to participate in the TSG Challenges! You can simply add the URL link from your project after it has been uploaded to your online craft gallery. If you upload your card to an online craft gallery, please use the keyword TSG215 so we can check out your beautiful work! Great card - I hope you join me at 52 Card Pickup again this week!